Designated National Scenic Area, standing by itself in the Beinn Eighe Nature Reserve overlooking Beinn Eighe, Slioch and the Torridon Mountains. Pine Martins visit the house regularly. This modern bungalow is built on the site of an old Scottish cottage, and is situated within the Beinn Eighe Nature Reserve which is renowned for it's variety of wildlife and mountain trails. The house stands entirely by itself and has commanding views on all sides, including two of Scotland's greatest mountains, Slioch and Beinn Eighe. The area is a haven for mountaineering, walking, fishing, bird-watching and nature lovers, with deer and eagles often seen. Pine martens visit the house regularly. Just a short distance away are Torridon, Loch Maree and some of the many sandy beaches and bays around Gairloch and Red Point. The areas attractions include whale-watching trips, ferry to the Isle of Skye, salmon, trout and sea fishing, golf course and pony trekking. Boat Trips on the famous Loch Maree available in the summer. Shopping and petrol are available in Kinlochewe Village which is approximately 1/2 mile away. The Kinlochewe Hotel is open most of the year, with a public lounge which provides bar meals etc. 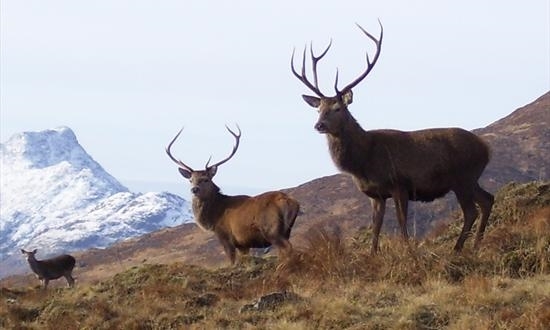 Fishing trips and guided hill walks are available by prior arrangement. Ground floor accommodation throughout. Double glazed throughout. heating by storage heaters. Comfortable and tastfully decorated lounge, with picture window overlooking Beinn Eighe,Slioch and the Torridon Mountains. Attractive fireplace. 2 large settees and spacious dining area. Colour TV with satellite, video and good selection of films, radio/cassette/CD player, large amount of books and games, telephone. The well equipped fitted kitchen includes a dishwasher, electric cooker, microwave, fridge/freezer, automatic kettle, food mixer and toaster, together with a good range of crockery and cooking utensils. There is a utility room with washing machine and tumble dryer. 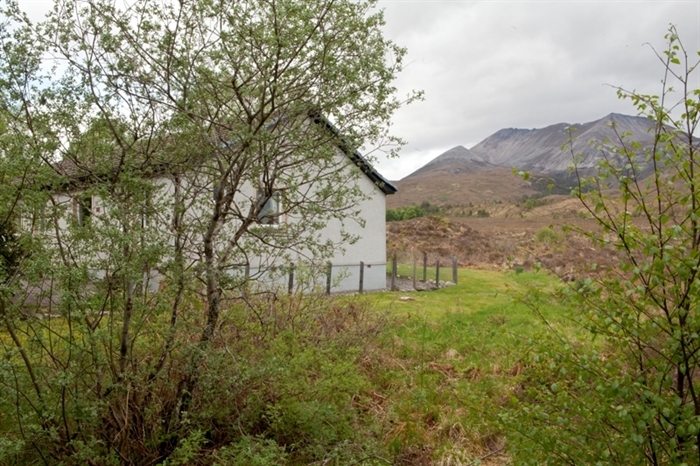 Spacious master bedroom overlooking Beinn Eighe. King-size bed, fitted wardrobes, quality dressing table and besidside cupboards. 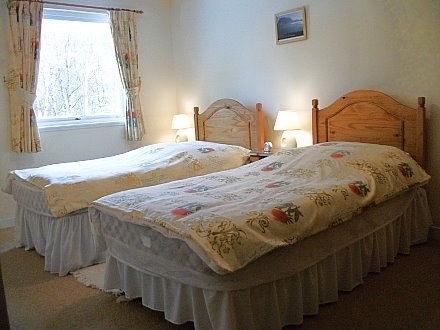 The 2 twin bedrooms have fitted wardrobes and quality furniture. Modern bathroom with 3 piece suite and over-bath electric shower. Downflow heater, heated towel rail. Further separate washroom with w.c. Sheets, pillow case, bath and handtowels and tea towels can be prvided at an extra charge. Electricity is metered and the amount will be deducted from your retainer. The meter will be read on arrival and departure. 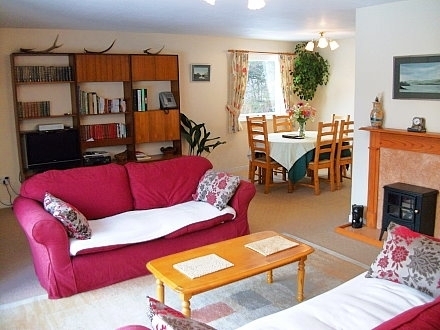 Ample parking space within the grounds of the bungalow. Well-behaved pets by arrangement. A deposit of 30% is requested in advance, together with a retainer £60. The balance is payable 6 weeks prior to the commencement of your holiday. Bookings are from Saturday 4pm to Saturday 9.30am. Please contact owner direct by phone or email before making a booking.